SIS Productions is a production company that strives to create, develop and produce quality works that involve Asian American women, their themes, and Asian American issues. 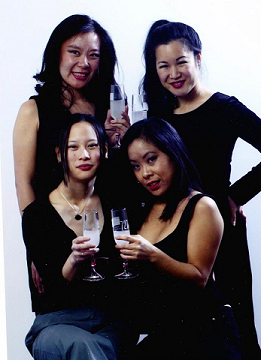 SIS Productions encourages opportunities and support for Asian American women to be involved in all aspects of the production of artistic endeavors. Please visit the links above to learn more about upcoming events and projects! To fulfill our mission, SIS established the SIS Writers Group in 2005 to encourage and promote local Asian American playwrights to develop their work and actively engage in the craft of writing new plays. The SIS Writers Group shares their work through Insatiable (playwright festival) and Revealed (site-specific theatrical tour of the International district).